Valentine’s Day is inching every closer. It’s time to start planning your special menu, including, of course, an amazing Valentine’s Day snack for kids! This year, I wanted to come up with something that my son would love, yet that’s also sophisticated enough for a romantic date night . As a working single mom, I don’t have a lot of time to mess around in the kitchen, yet as a dating single mom, I feel bad when my boyfriend whips up amazing dinners and all I have to offer is a store-bought cake. So I did my best to come up with something that, to me, is the best of both worlds! Over the next 11 months, we’re going to be sharing different ideas for the TruMoo Limited Edition flavor of the month! Are you excited? I know I am. My son is thrilled too, he absolutely LOVES TruMoo! This month, we’re focusing on one of my all-time favorites: TruMoo Chocolate Marshmallow. 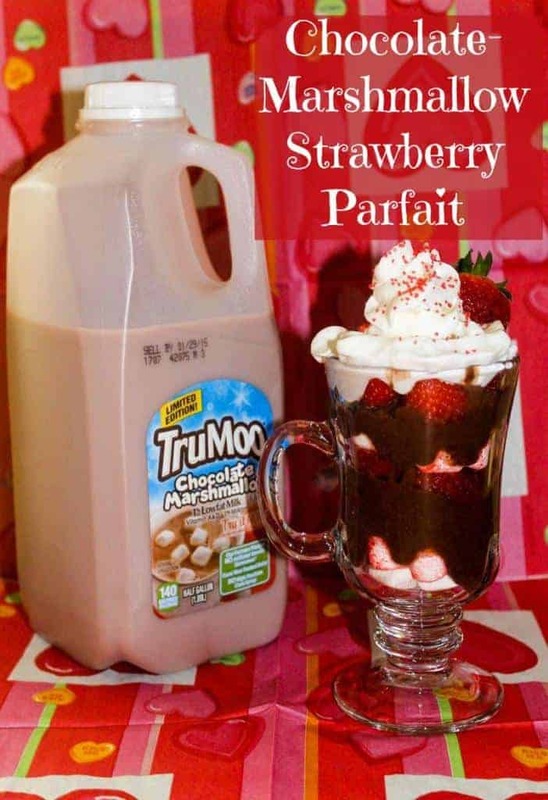 It’s the perfect ingredient for my Chocolate Marshmallow Strawberry Parfait Valentine’s Day snack recipe. Mix the pudding according to the pie filling directions, but swap out the regular milk for the TruMoo Chocolate Marshmallow milk. It’s important to follow the pie filling directions because it gives you a thicker pudding. Set it aside to thicken. Slice your strawberries. The number really depends on how many parfaits you want to make. Go with about three medium strawberries per parfait. Throw a handful of mini marshmallows in a plastic baggie and add about two drops of food coloring. Shake it really well. Now, I’m going to be honest, my marshmallows looked like something out of a horror movie at first. Don’t worry about this too much, as you’ll be layering them and combining them with plain marshmallows. Of course, you can always just look for red or pink marshmallows and call it a day, but I couldn’t find them anywhere. Since I was determined to have pink marshmallows in the parfait, I came up with this workaround. Start with your marshmallows, adding both the crazy red ones and a few white ones to the bottom of your glass. Add another layer of marshmallows, followed by pudding. Continue layering to the top. Add whipped cream and some pretty pink sugar crystals. That’s it! It tastes like chocolate-marshmallow covered strawberries! Plus, it takes less than ten minutes to make. The longest part is mixing the pudding. I can put it together on a work break before my son gets home from school and it will be ready when he walks in the door. It holds up well in the fridge, so you can prep it ahead. 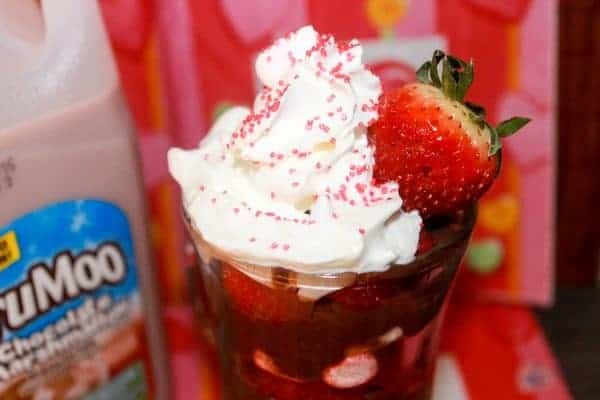 I feel good about my Chocolate Marshmallow Strawberry Parfait Valentine’s Day snack because I know when I use TruMoo Milk, my son isn’t getting any nasty hormones or high fructose corn syrup. Jacob drinks a lot of milk. Actually, that’s an understatement! He’s an incredibly picky eater, but he’ll drink a gallon of milk a day if I let him! So it’s very important to me that he drink the very best. To me, that’s TruMoo. For product information and availability, visit TruMoo online. Looking for more delicious recipes? Find TruMoo Recipe inspiration on Pinterest. I also recommend that you Join the TruMoo community on Facebook. What do you think of my easy Valentine’s Day snack for kids? What’s your favorite Limited Edition TruMoo flavor? Tell us in the comments! This looks delicious! It’s a must try for sure. This looks so delicious! I’ve actually never tried trumoo before so I don’t know anything about the Limited edition flavors. But I do know I so want to make this parfait. I have never heard of chocolate marshmallow milk before. My kids would go nuts over something like this. Awesome post. It was not only an interesting article but it offered me great tips to use in my blog! Thanks a lot! Who knew that milk comes in the flavor marshmallow I am going to have to look for that at the store. We have never had Trumoo before. My little one would love it as she likes milk flavored with chocolate. 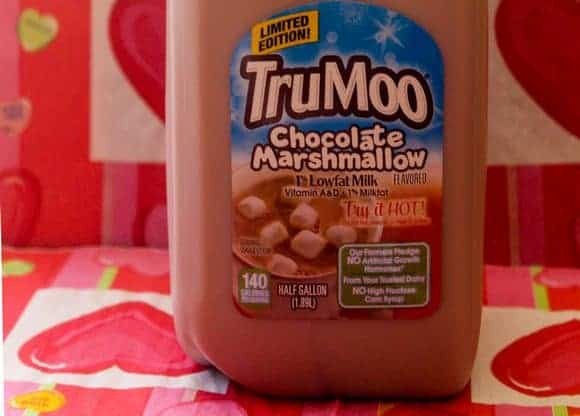 Oh we just love Trumoo here at our house and I think I might have to try this recipe, the kids would love it. Thank you. My kids love Trumoo. It goes with anything and perfect for anytime of the day! My kids would LOVE this. A little milk and strawberries are a treat for any holiday. Mmmm, strawberries and chocolate. Sign me up! I have never in my life seen marshmallow chocolate milk. Sounds delightful! That chocolate milk looks good. I don’t know if it would last long enough to be made into anything around here. This is absolutely yummy & delicious. Strawberry is my favorite & adding chocolate Marshmallow is a great combination & a perfect recipe for Valentine’s day. Thanks for sharing the recipe. I like the name, True Moo. That’s cute. Kids love chocolate milk. This looks so delicious and easy to make. I have to make one of these for myself! This is something I’d love to have all to myself! I love Trumoo. I didn’t realize you could do so much with it. 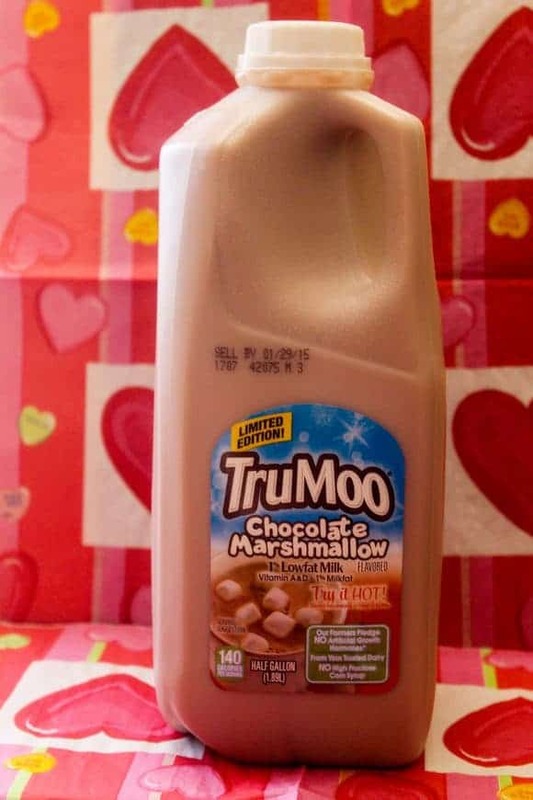 TruMoo chocolate milk is my kids’ favorite. They always ask for it because it’s so creamy. We are bbig fans of true moo chocolate milk, kids and hubby love it I do too. This parfait sounds delicious! I don’t know if I’ll be able to wait until V-Day to try it. Chocolate marshmallow milk? Who would have thought to put that together? Then add strawberry’s – oh boy! Delicious! Yum looks so good! I have never seen tru moo here before but I would love to try this! That sounds so good. Any combination of chocolate and strawberry is a winner in my book. When I saw the photos, I was like “wow”! I must recreate this, looks really delicious. That looks so good! My kids love anything with chocolate milk. That sounds absolutely delicious! My kids would love that.